Scanned PDF to Excel Converter can help you avoid typing every single characters of an lengthy message that cannot be copied to helpdesk. It can directly extract character and latout saved in image pdf file to Excel. Features of Scanned PDF to Excel Converter : 1.Support all Windows systems both on 32-bit or 64-bit. 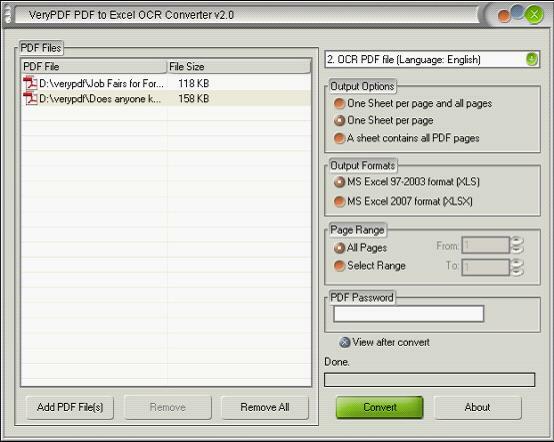 2.Convert scanned PDF to editable Excel---scanned PDF to XLS or scanned PDF to XLSX based on different languages. 3.Convert all pages of PDF into one single sheet Excel. 4.Convert all pages of PDF files into one sheet amd in single sheet correspondingly. 5.Convert encrypted PDF files to XLS or XLSX easily. 6.Support drag and drop of PDF files. 7.Support specifying the converting page range of PDF. 8.Preview XLSX files automatically. This site does not contain serial number, crack, keygen Scanned PDF to Excel Converter serial number : serial number is the simplest type of crack. A serial number(cdkey,product key,etc) is register the program as you may already know. a crack or keygen may contain harmful software. If you cannot find the exact version you want, just give it a try. for more information read .nfo/.txt/.diz file include in zipped file.